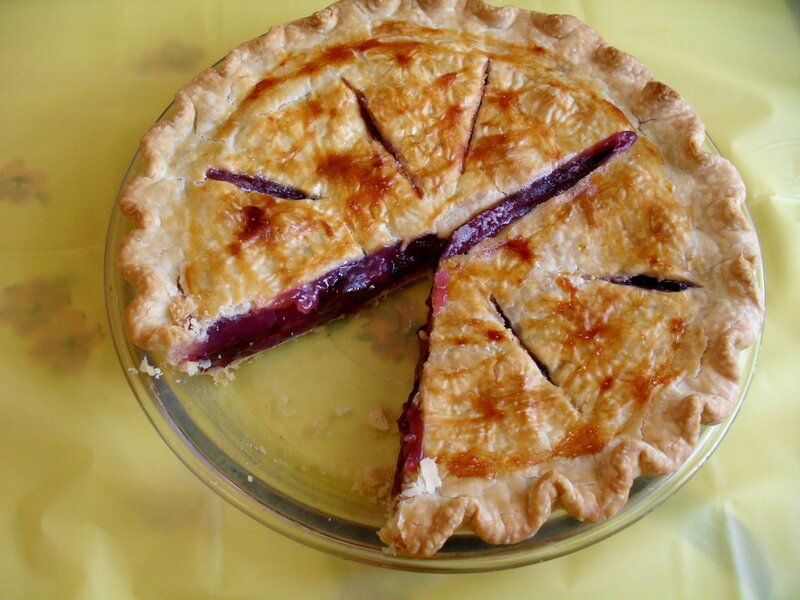 If you’re a fan of Janet Evanovich, you might have recognized the “Plum Lovin'” part of the pie title. I just couldn’t help myself! I’ve read every one of the Stephanie Plum novels! I’m kinda addicted to them the same way I’m addicted to sugar. Epic, brain-stimulating meat and potatoes novels have their place, but we all need book desserts once in a while too, and this series is mine. This gorgeous dish belongs to my Mother-in-Law, who got it indirectly from her own Mother-in-Law. 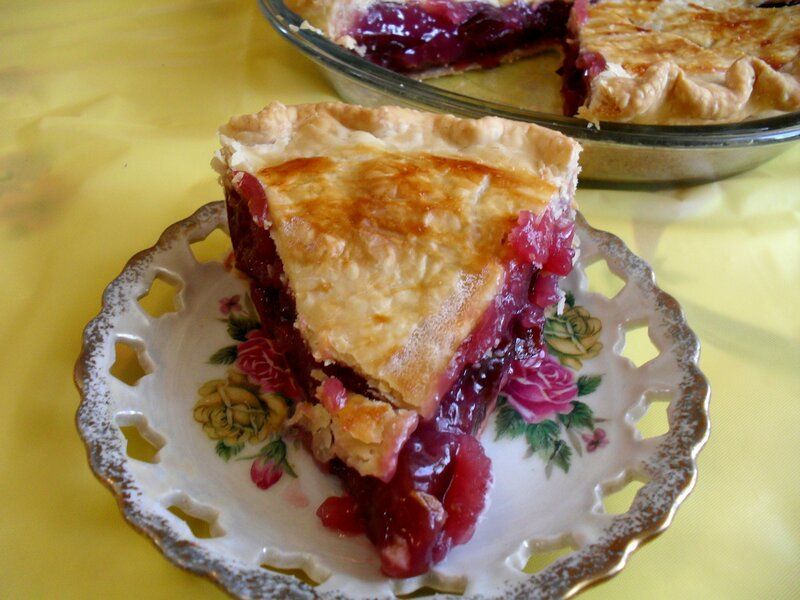 Anyway, I thought I’d get this recipe up in honor of mothers since I first made this pie for Mother’s Day last year. It disappeared so fast that I didn’t realize I failed to get a picture until it was too late. It got high praise at my husband’s family’s annual Mother’s Day barbecue and again this year on Easter. It’s a very simple pie that doesn’t disappoint. Do ma a favor and make her one yourself! And get her a copy of One for the Money while you’re at it! This pie is best with my favorite pie pastry, which I used the first time, but pictured is the pie I made in a pinch with Pillsbury refrigerated pie dough. Although I could never condone such methods (do as I say and make your own crust, not as I do), it works and the pie doesn’t suffer much for the added convenience. Place the oven rack in the lower third of the oven and preheat to 400 degrees. Strain the juice from the plums into a large saucepan. Cut the plums in half, then half again, pitting as you go. Set plums aside. Mix together the sugar, flour and salt in a bowl. Do not skip this step or you’ll have flour lumps. Pour the mixtures into the saucepan with the plum juice. Cook the mixture over medium heat stirring often at first, then constantly as the mixture heats. Cook and stir, scraping the bottom of the pan with a wooden spoon until the mixture is very thick and gooey. Turn off the heat from under the sauce pan. Add the almond extract and sliced plums and stir to combine. Set aside. Line a 9″ pie plate with pastry and brush lightly with egg white. Pour the hot filling into the pie dish, arranging the plums around if needed. *Don’t overfill the pie. Leave out a little of the juice if it gets too full. * Dot with butter and top with the top crust. Flute, brush the top with some of the remaining egg white, and cut vents into the dough. Place a pie shield over the crust and bake pie for 30 minutes, then remove the pie shield and bake for about 10 more minutes, or until golden brown and done on the bottom. Remove from the oven and cool on a cooling rack for several hours or overnight. 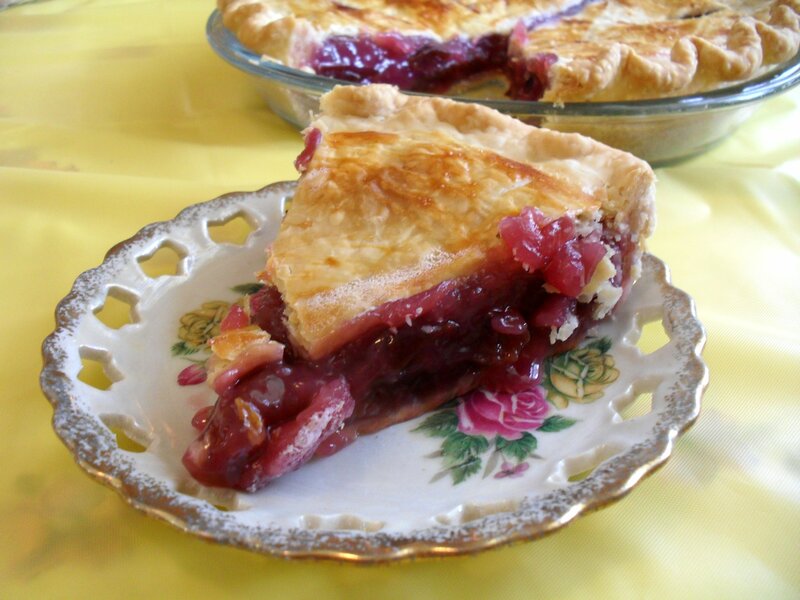 Posted in Pie and tagged janet evanovich, mother's day, plum lovin, plum pie, recipe. Bookmark the permalink. The pie looks good and so do the books! How many books are in the series? I’ve heard of her but never read her books. I’m going on vacation in a month and that is my prime reading time! Let me know where I should start with her books! One for the Money is the first in the series. This looks beautiful! I bet all the moms at the BBQ were appreciative of this delicious sounding pie! Veronica, I just rated it but I am so mad there are only 5 stars! This totally deserves 25! 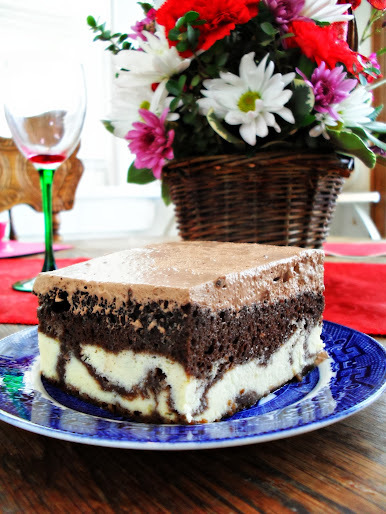 It looks so delish! I love how it cuts so clean and nicely! LOVE IT! Aw, you are so sweet! It is my aim to always have a pie that cuts nice and clean with no oozing, and then I found out that a little oozing is something they look for as desireable in our state fair pie contest. Who knew? What a pretty pie V! 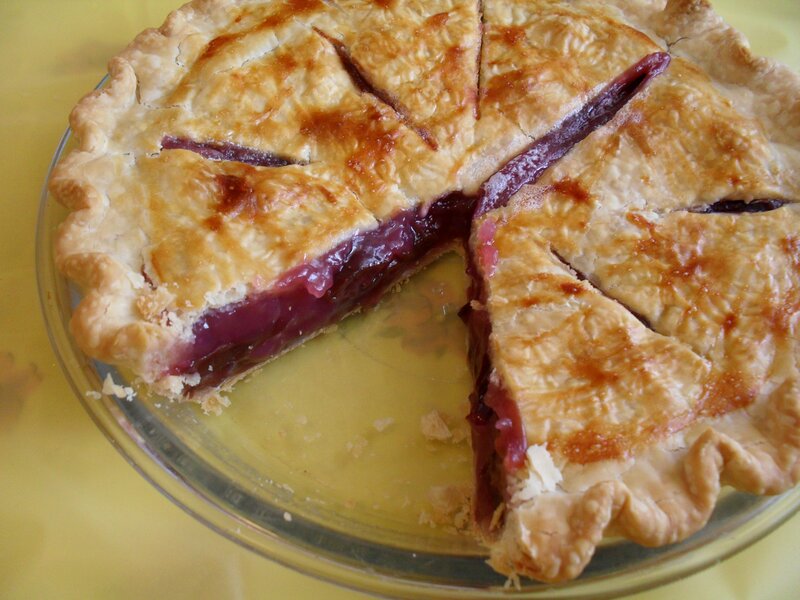 I love plum pie. I’m glad you like this not to fancy recipe. I love it. You are the pie goddess! That pie looks spectacular!!! That plate is beautiful! Thanks for letting me know that the Cravory link was broken on my blog. Hmm….now I want pie AND cookies. My daughter Ava, in college, is begging for this pie. I have to make it when she is home!! LOL, so she saw it, sent you the link and told you to make it? My kind of girl! Good luck! All right, our similarities are getting to be a little unnerving! I love the Stephanie Plum novels! Hah. I have been lax the past few years though, and I need to catch up with them. What a pretty pie. The color is wonderful. I have some almond extract dislikers over here, would it detract much from the flavour if I used vanilla extract or half and half (half vanilla, half almond)? I feel the almond extract dislikers pain. I used to feel ill if I tasted it, I was so repulsed by it. But I really LOVE it here in this pie. If even a tiny bit will make them run and hide, go ahead and substitute because my opinion is strongly based on that I love the pie as is. If I hated any hint of almond extract, I definitely would not use it.